For other posts in this series, click on a number: 1, 2, 3, 4, 5, 6, 7, 8, 9, 10, 12, 13, 14, 15. ...to encounter Jesus as the incarnate person Jesus is, to share in God's life by sharing in Jesus' person. And I think what the incarnation does is give me the gift of sharing in God's life by sharing in the personhood of others. I think that the incarnation, the revealing of God's person in Jesus, makes personhood the very structure within which we encounter God. So to claim the incarnation for ministry is to claim that we share in God's life, that we have union with God, through sharing in the personhood of our neighbor (p133). In order to grasp how Jesus shares our humanity while also sharing God's divinity, it is important that we wrap our minds (and hearts) around the orthodox doctrine concerning the hypostatic union. 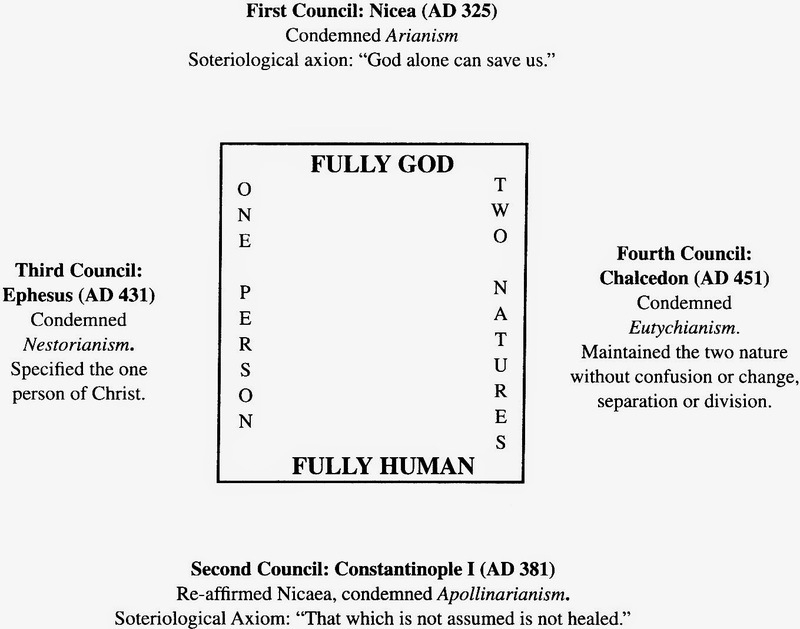 This doctrine was developed by the early church councils (see box below) as they sought to apprehend the stunning truth of Jesus' union with God and humanity as one hypostases (person) who possesses two natures--one human and the other divine. Jesus, in himself, is the complete, personal sharing of humanity in God's life and of God in humanity's life. Thus we find at the very heart of orthodox Christian confession the reality of a dual-sharing that is established in the one person of our Lord, Jesus Christ. Therefore, ministry, which is what Jesus does, because of who Jesus is, is fundamentally about sharing--specifically, the sharing of personhood, which leads to union of persons (see p134). As [Mary] embraced Jesus' person, she exposed her own. She became vulnerable; her person unveiled before him. She sought to join Jesus' person through the brokenness of his coming death (p134). Authentic Christian ministry is like that--it's sharing in what Jesus is doing to fully, intimately, share in the life of another--opening fully his person to theirs. Think of a ministry of giving food to hungry people. Is that authentic Christian ministry? Well, it would be if it involved us in real sharing in the lives of those people. Jesus doesn't merely hand food to a person as he runs by. Rather, he enters into relationship with them at the point of their need and feeds them both in body and in spirit, relating to them as persons--as true brothers and sisters. Our calling as ministers with Jesus is to join him in that sort of real place-sharing. As Root goes on to note, "Sharing is the core of the church of Acts; the members share their things as the more fundamental sharing of their person" (p135). This is why Ananias and Sapphira were harshly disciplined in Acts 5--they faked sharing their goods, thus withholding the most important sharing, which is a sharing of themselves. Their scheme risked terribly damaging the community in its formative stages. If true place-sharing is to occur, freedom and honesty are essential. Thus we see why a pastor cajoling people--arm-twisting them into program participation--would be so damaging to true ministry. It would undercut the very freedom that is fundamental to authentic sharing. The "heavy lifting" to which pastors are called is not arm-twisting, but "the difficult and beautiful task of creating an environment that allows people to share" (p135). In the hypostatic union that is Jesus, there is complete sharing where neither nature is in any way diminished. The divine nature remains truly and fully divine; the human nature remains truly and fully human. However, the two natures fully indwell the other, yet never in ways that one nature is lost to the other. Thus it is in and through Jesus' own hypostatic union that we humans encounter and share in the divine life. As Root notes, "We can only share in God's life through the humanity Jesus shares with us....Jesus' person becomes the location, the stage, of the union of the divine and human" (p138). This reality that Jesus is, points us to the nature of authentic (real) Christian ministry, which is a sharing in what Jesus is doing to fulfill the Father's mission, which is to be in relationship with all humanity. And what Jesus has done and still is doing to fulfill that mission is not passive--he is not waiting for humanity to come to him for relationship with God. No, God came to us--he became one of us (through the Incarnation). The hypostatic union created the reunion, the relationship by which God opened his heart to us, "allowing us to share in God's life as children and no longer as servants (John 15:15)" (p138). We'll stop here for now and pick up this vital truth next time.